Bishop Nikki Ogamba is the Founder, CEO and President of "Open-Door Communication Network" (OCN) which is a 24 hour Christian TV Station that airs the good news of our Lord Jesus Christ around the Nations of the World. Bishop Nkiru “Nikki” Ogamba is the founder and overseer of All Nations Living Fountains Church (ANLFC) and World Outreach Center. ANLFC. The headquarters church is in Los Angeles, California. Bishop Nikki has a heart that yearns to see the glory of God declared among the Nations through the gospel of Jesus Christ. It is her earnest desire to see men and women of all nationalities freed from the power of darkness and be en-grafted into the kingdom of our Lord Jesus Christ by the power of the Holy Spirit. She desires to see the people of God experience the manifestation of the glory of God in every aspect of their lives. Since 1985 she began to take trips around the world in obedience to God’s voice to make disciples of all Nations. She believes that by planting churches and building schools for the young people, and training them at an early age, they will be better equipped to respond to the Gospel of our Lord Jesus Christ at an early age. She also believes that by providing medical clinics in the villages, cities and planting Schools of Ministry, the liberating light of the gospel of our Lord and Savior Jesus Christ will be made manifest in the lives of the people. By the grace of God, churches have been planted in Nigeria, Belize, Sierra Leone, Liberia, Guinea Bissau, Republic of Guinea, Uganda, Kenya, Gabon, Ivory Coast, Congo, Philippines, United States of America, and more churches yet to be birthed into the Kingdom of God in other countries. She is also an electrical engineer as well as a Mathematics and Science educator. Bishop Nikki is married to Dr. Chris Ogamba together with her husband they have three kids, Chibueze, Ogechi, and Isaac. The voice of the Lord thundering across all four corners of the globe, declaring God's Glory to all Nations. Psalm 29. 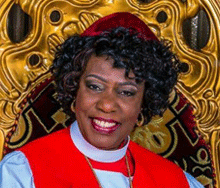 Archbishop Margaret Benson-Idahosa, Archbishop of the Church of God Mission International from Benin City, Nigeria is wife of the late Archbishop of Church of God Mission Int’l. Inc., Most Rev Prof. Benson Idahosa and currently the Presiding Bishop of the ministry with several branches and hundreds of thousand of members worldwide. She also pastors the 5,000 capacity Faith Miracle Center Church where multiple services are held weekly. Archbishop Margaret Benson-Idahosa was born into the royal lineage of the Benin Kingdom. She was ordained into the Ministry on the 24th of May 1983 and consecrated Bishop on the 5th of April, 1998. This position makes her the first female Pentecostal Bishop of a ministry of this magnitude, in Africa. She was consecrated in November, 2009, Archbishop of the Church of God Mission International. Together, with her husband, she has preached the gospel of Jesus Christ in more than 140 nations, covering the entire continents of the world. She is not just a woman preacher, she doubles as a father and mother to many spiritual children all over the world. Her vision and mission is to “reach the un-reached” irrespective of their location, whether in the desert or riverine creeks. Since her consecration as Bishop, she has frequently traveled to America, Europe and parts of Africa and in communities far from major towns and cities, preaching, teaching and healing the sick. She also has to her credit an orphanage for abandoned babies. Three of these children have been adopted into the Idahosa family. The ministries of Dr. T.L. Osborn, Dr. Daisy Washburn-Osborn, and Dr. LaDonna C. Osborn, President and CEO of Osborn Ministries International, Founder of the International Gospel Fellowship have made an unprecedented impact on the world. They are valued among the great soulwinners of this century. Osborn Ministries International was instituted in 1949 as a world evangelism and missionary church organization. The OMI commitment: To express and propagate the Gospel of Christ to all people throughout the world. Their motto: One Way – Jesus; One Job – Evangelism. Their guiding principle: The top priority of the church is the evangelization of the world. For nearly 70 years, the Osborns have proclaimed the Gospel to millions, face to face, in more than 100 nations. Their crusade audiences have numbered from 20,000 to over 300,000 people per meeting. Osborn Ministries International literature has been published in more than 132 languages and dialects. They have produced DocuMiracle crusade films, audio and video-productions and crusade audio sermons in 80 languages to inspire public evangelism. The Osborns have also written & produced a vast library of Bible and ministry training courses to equip others to do the work of ministry. OMI has sponsored over thirty thousand qualified national preachers, both women and men, as full-time missionaries to their own tribes and neighboring villages where the Gospel of Christ had not previously been. 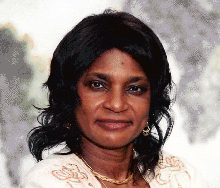 Dr. LaDonna C. Osborn is President and CEO of Osborn Ministries International. She is Founder of the International Gospel Fellowship, which includes more than 60 ministries, over 800 churches in nearly 50 nations. Dr. LaDonna is also co-founder of the Women’s International Network, which encourages, educates and equips women for all areas of Christian ministry. Her headquarters church, International Gospel Center, is located in Tulsa, Oklahoma. Dr. Osborn’s national and international travel and ministry schedule includes: Osborn Gospel Training Seminars, Mass Miracle Evangelism Festivals, Pastors’ and Leadership Conferences, Women’s and Missions’ Conferences, plus Bible School and Seminary lectures. 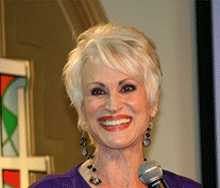 Her Bible and teaching courses, books and audio/video materials are distributed globally. While continuing to expand the Osborn Legacy of face-to-face ministry to the unreached, Dr. LaDonna C. Osborn also utilizes the Internet on the World Wide Web to transmit the Gospel of Christ to people and places formerly beyond reach.